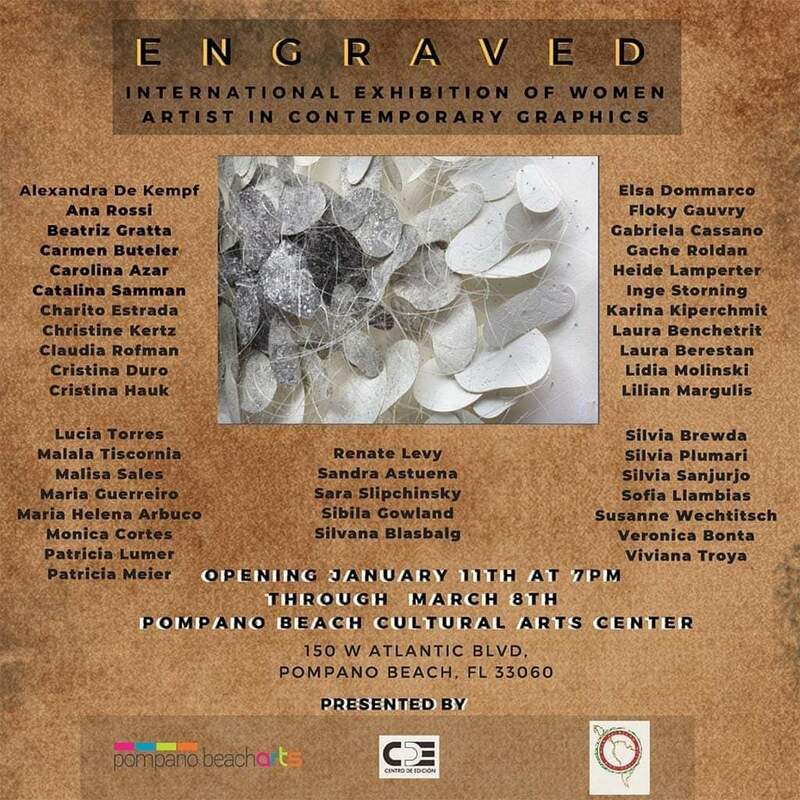 The Pompano Beach Cultural Center is delighted to announce their newest exhibition, “Engraved”. This collaboration with The Buenos Aires Editing Center in Argentina and the Latin American Art Pavilion Project (LAAP) celebrates the work and artistic development of women in the visual arts field. Forty European and Latin American female artists from Argentina, Austria, Ecuador and Venezuela will present some of their most representative pieces. The exhibition runs January 11-April 5, 2019 and is free and open to the public. “Engraved” features artists from different regions of the world who develop their artistic work through techniques such as lithography (printing or calcareous stone), printmaking (engraving in metal or wood), digital drawing and graphics, using mostly paper as a noble support of the representative depth of the images. The artworks will be exhibited following diverse techniques that highlight their individuality: with frames, without frames, as installations, and within showcases generating a climate of strength and subtleties. This demonstrates the virtues and characteristics of each individual work but, as a whole provides the viewer with an intense and harmonious journey into the world of each of these artists.